Everywhere you look, there are flowers. Pale and bright yellow sunflowers towering above your head. 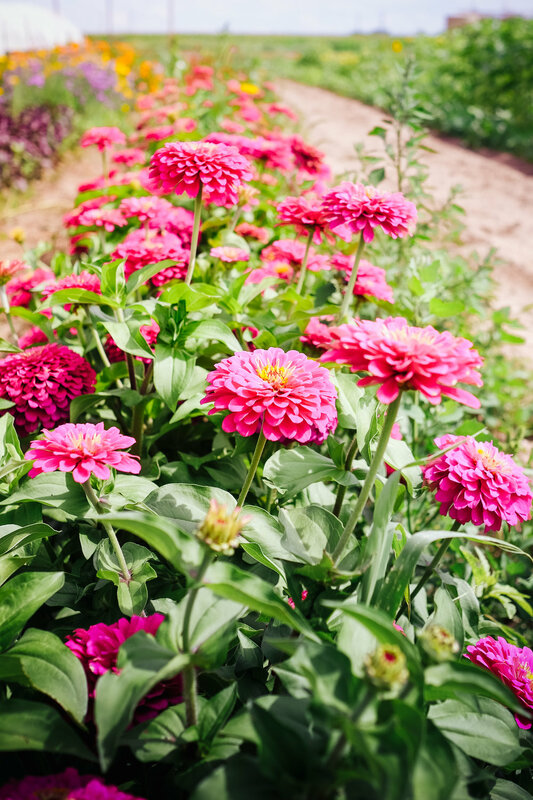 Rows of eye-catching zinnias and knee-high snap dragons. Bunches of delicate purple, white, and pink lisianthus. And, of course, dahlias. Acres of them. 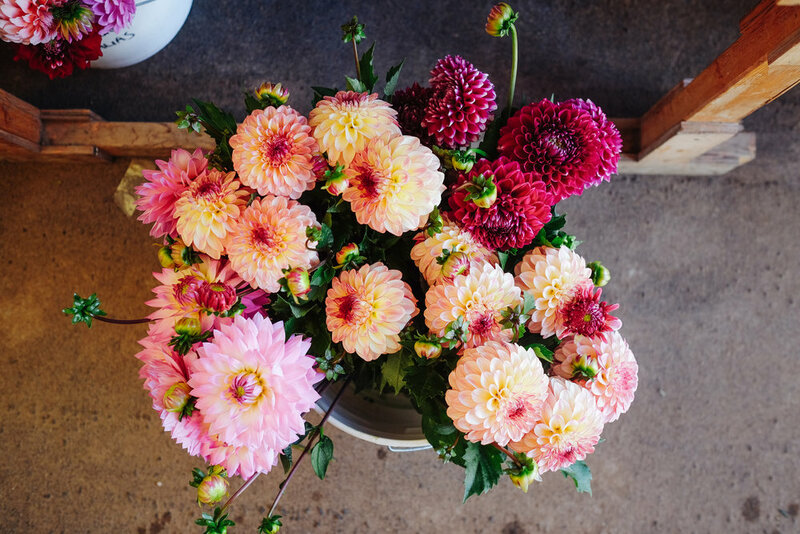 In every shape, size, and color imaginable: tightly curled cactus dahlias; ball, collarette, and waterlily varieties; not to mention jaw-dropping dinner plate-size blooms. 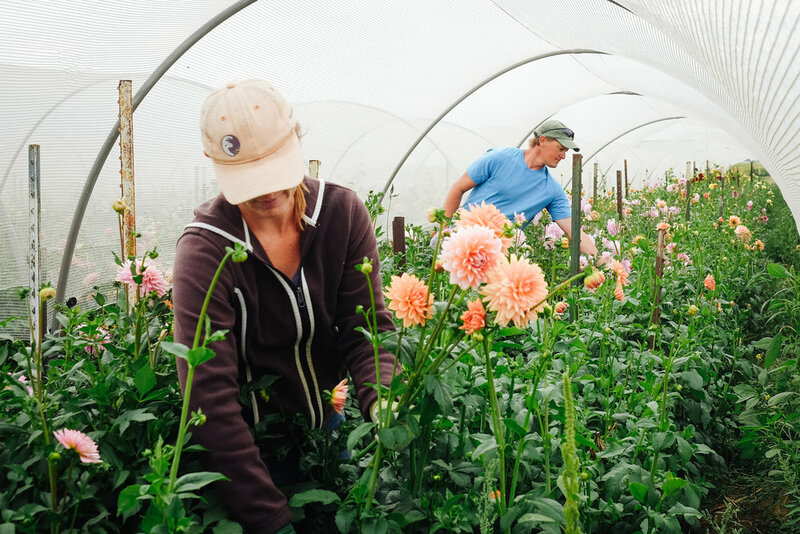 This is the scene from the heart of one of Northern Colorado’s premier flower farms, Arrowhead Dahlias. 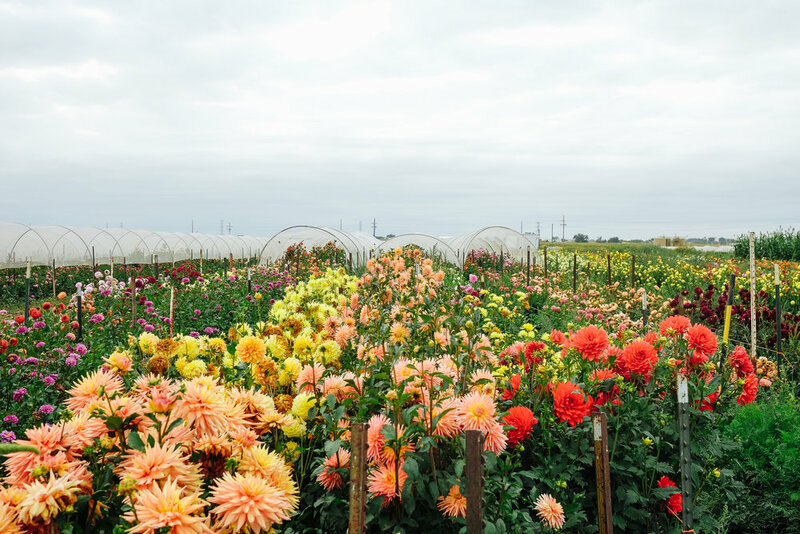 Owned and operated by husband and wife team, Calvin and Julie Cook, this niche flower farm in Platteville currently grows over 300 varieties of flowers on four acres of fields. The variety and volume of flowers Calvin and Julie are able to produce on such a compact plot of land is due, in part, to their decades-long dedication to flower farming. After graduating from Colorado State University with a landscape and horticulture degree, Calvin initially thought he might go into the landscaping design business. He followed his heart toward flower farming instead. “I guess I was hooked pretty early,” he says. “Dahlias are so diverse. The excitement of growing a new variety and watching it open for the first time… each one is so unique.” So Calvin began growing dahlias for himself in 2000 and shortly afterward started selling his extra tubers via a mail order catalog he sent out to other home gardeners. In 2003 he married Julie, another horticulture alum from CSU, who had a long-standing affinity for perennials—and work history with an arboretum and wholesale nurseries. The two began growing flowers together, renting out a small field in Northern Colorado. A year later, they attended their first farmer’s market in Greeley where they received solid sales and positive feedback from soon-to-be repeat customers. By 2007 they had grown big enough to purchase their own farm. The Cook’s affection for the flower business runs so deep that when you ask Calvin to name his favorite dahlia variety, he goes quiet. It’s like asking a parent to pick his favorite child, impossible to answer. But watching Calvin and Julie work in their fields offers a few hints as to why they’ve dedicated their work lives to flower farming. The strong plants easily grow waist high, some reaching 6 or even 7 feet. They bloom robustly until first frost, when other cutting flowers begin to fade. And their variety is so undeniably diverse, there’s a dahlia to please everyone. From the small, daisy-like blooms and varieties that resemble exploding fireworks to the massive giants with flowers over a foot in diameter, they fit into any home garden. Not to mention that walking through the quiet fields during harvest season has got to be one of the prettiest working spaces there is. After almost two decades in the flower growing business, Calvin says he thinks he and Julie have “finally figured out a formula that works for us.” The Cook’s reputation for supplying exquisite, long-lasting blooms has helped them establish partnerships with large wholesalers who supply florists all along the Front Range. Their attention to quality paired with the increasing popularity of locally grown flowers has also brought them a cult-like following at the Longmont Farmer’s Market. They regularly sell out of fresh cut flowers within a few hours on summer weekends. It’s fascinating to watch customers enter their booth. Some regulars walk right up, wave, and ask for their “usual” order. Others linger as they debate between an abundance of showy individual stems or colorful, pre-made bouquets. And if you show up with a camera and mention that you’re doing a story about Calvin and Julie, one or two devotees may even offer to send you images of Arrowhead’s dahlias in their home.